white rice bread.....not so bad. whichever way ya wanna look at it. plus....it makes a mighty fine door stop. 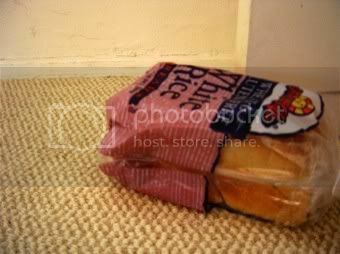 I'm trying to visualize where you're using your new bread door stop, and it looks like it might be the office door. Hmm. Does Jozee the Dog know about this use of food at her height? We're getting close to wrapping up our second of two shows for the day, fingers crossed that we'll be home soon. jozee hasn't sniffed it out, cuz, well......she's in the atrium. are you not eating gluten? well, i'd say in the past day.....yes. nothing (more or less than) potatoes, rice and carrots. i've pretty much eliminated all culprit intolerance foods (soy, dairy, egg.....with some minor slip ups) and now i've added gluten to the mix and am giving it a go. are you celiac by chance? i need to get your numbuh. and i HHHHHATE phones, yah? but, email it to me if you're comfy: artworkslive@yahoo.com........let's e-chat more. i'd like that anyhoo, regardless of all the health talk. i just discovered tonight my spray oil contains SOY, and i've been TRYiNG to avoid soy all this bloody, fargin' time. no wonder. explains so much? so little??? i don't even begin to understand anymore.... tricky dicky, it is, you're so right.